Pat Riley (Kentucky) and the Miami Heat begin their search for another NBA title tonight as they face the San Antonio Spurs in Game 1 of the NBA Finals. Pat Riley is a man of his craft. He has won NBA championships as a player, coach and, most recently, as Miami Heat team president, a post he’s held since leaving the head coaching position in 2008. Championships define success in sports, and multiple championships mean greatness. His basketball legacy is unmatched, and he isn’t stopping anytime soon. Riley’s basketball career began in Schenectady, NY, where he grew up the youngest of six children. A star on his school’s varsity basketball team, Riley chose to play college ball at the University of Kentucky after legendary head coach Adolph Rupp personally recruited him. Kentucky was where Riley’s basketball persona began to take shape. He became a star at the University of Kentucky, earning SEC Player of the Year his junior year. It was also at UK where Riley joined the Gamma Iota Chapter of Sigma Nu. Riley’s first interaction with a championship game came his junior year when he led the 27-1 Wildcats against Texas Western with the 1966 NCAA Championship on the line. Bounds said that he and his teammates overlooked them, even though Texas Western had only one loss coming into the game. Louie Dampier, Kentucky’s starting point guard, who was All-SEC and an AP All-American that year, had the ball stolen from him three times in a row by Texas Western’s point guard, Bobby Joe Hill. “That’s when we knew we couldn’t take these guys lightly,” Bounds said. The story of the Kentucky vs. Texas Western game was made into a movie, Glory Road, as they beat Riley and the Wildcats, 72-65. Bounds described Riley as “one tough hombre.” A very competitive person, he said that those traits have served Riley well in his successes in the NBA. In a recent phone interview, Bounds, who currently resides in Frankfurt, Ill., told the story of LeBron James’ free agent courtship by Pat Riley. Bounds said that his friends, who were Bulls fans, were excited at the prospect of signing one of the best players in the NBA to their favorite team. Bounds tried to quell their excitement, however, telling them to look out for Riley, who he predicted would successfully bring LeBron to Miami. Needless to say, James did not end up in Chicago thanks in large part to Riley’s role as team president. After Kentucky, Riley was drafted by the San Diego Rockets in the first round of the NBA draft. He played limited minutes before bouncing around to the Portland Trail Blazers, and then signing with the Los Angeles Lakers, where he found himself teammates with the likes of Jerry West, Elgin Baylor and Wilt Chamberlain. Riley played sparingly, coming off of the bench for just nine minutes a game during his first year with the club. Riley became known for his tireless work ethic, to the point where West would occasionally have to coach Riley in harnessing his intensity during practices. In 1972, Riley and the Lakers embarked on a 33-game winning streak, an NBA record (coincidentally, Riley’s Heat team this year challenged the streak, tallying 27 wins in a row). Riley came off the bench that season, quickly becoming head coach Bill Sharman’s go to sixth man. That team in 1972 went on to win 69 games and defeated the New York Knicks for the NBA title. The 1972 Lakers are widely considered to be one of the best teams of all time. Riley played three more seasons for the Lakers, a total of five, before being traded to the Phoenix Suns three games into his fourth season. Riley would play only one season with the Suns, retiring in 1976. In 1977, Riley, longing for a return to the game, found himself hired as a radio play-by-play man for the Lakers. Riley called games for two years, until during the 1979-1980 season a twist of fate changed Riley’s second act in basketball. Then Lakers head coach Jack McKinney was injured riding a bike to play tennis with Paul Westhead, a Lakers assistant coach. McKinney crashed and, upon being found unconscious, was rushed to the hospital. McKinney’s vitals were fine, but doctors kept him in the hospital. The Lakers, now without a head coach, needed one in a hurry. They promoted Westhead who, after six games, was allowed to continue coaching throughout the season. Westhead had one demand, however: that Riley serve as his assistant coach. In Riley’s first year as a Lakers assistant coach, the team won the NBA title. Led by veteran Kareem Abdul-Jabbar and rookie Magic Johnson, the Lakers defeated the 76ers on their home court, with Johnson recording a near triple-double in game six in place of injured star Abdul-Jabbar. The 1981 season was a disappointment as the Lakers managed to win 54 games but would stumble in the playoffs as they watched the rival Boston Celtics defeat the Houston Rockets in the NBA Finals. The 1982 season began similarly to how the previous season had ended and after eleven games, Paul Westhead was fired as head coach of the Lakers. The Lakers wanted Jerry West to be head coach. West wanted Riley to be coach, and an awkward compromise formed: the Lakers had asked West to be the team’s offensive coach, whereas Riley would assist on defense. West thought he’d be merely helping Riley out. Riley didn’t know what to think. In the end, everything worked out. Sporting the Western Conference’s best record midway through the season, Riley was coach of the West for the All-Star game. His Lakers team earned the number one seed in the playoffs, and cruised to the Finals where, once again, they defeated the 76ers in six games. 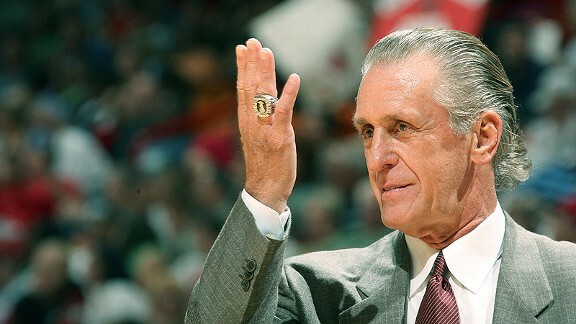 In his first year as a head coach, Pat Riley had himself a championship ring. Riley would win three more championships with the Lakers, in 1985, 1987 and 1988. After winning his first title in 1982, Riley’s Lakers lost in the Finals the next two seasons, to the 76ers in a sweep and to their archrival, the Boston Celtics, in seven games. The next season, the Lakers defeated the Celtics 4-2 for the championship. In 1987, after missing the Finals the previous season, the Lakers again defeated the Celtics in six games for another title. In the locker room after their victory, Riley guaranteed a repeat next year, and issued his statements once more to the city of Los Angeles in the Lakers’ championship parade. Riley delivered on his promise, as the Lakers beat the Detroit Pistons in seven games in 1988. The next season, the Lakers were swept by the Pistons in the Finals. The year after, Riley’s team failed to reach the Finals and he resigned from the team. Ironically, 1990 was the first year Riley had been named Coach of the Year. Riley then went on to coach the New York Knicks, leading the team to the 1994 NBA Finals where they lost in seven games. Riley spent another year with the club before moving on to be the head coach of the Miami Heat, where he has served in various roles ever since. Riley is often pictured in telecasts of Heat playoff games, usually sitting behind the Heat bench, but not too close to the players. Riley is stoic; rarely do you find him offering the slightest emotion on his face. Riley coached the Heat from 1995 to 2003. Before the start of the 2003-2004 season, Riley stepped down as head coach and took over as the team’s general manager. Under Riley, the team drafted Dwayne Wade in 2003, and saw him turn into one of the league’s most dominant players. At the start of the 2005 season, head coach Stan Van Gundy resigned from his duties, and Riley assumed the head coach position once again. Riley took the Heat to the NBA Finals, where the Heat defeated the Dallas Mavericks in six games. After last year’s championship, Riley had amassed eight NBA Titles; one as a player, five as a coach (one as an assistant coach), and one as an executive. Now, as acting President of the Heat, Riley is in search of a ninth championship ring. In every level of his NBA tenure – tireless player, hard driving coach and esteemed executive – Riley has inspired excellence among his fellow coaches, players and teammates. Pat Riley has found ways to get buy-in from all players with his uniquely positive approach to leadership. If LeBron James is the face of the Heat franchise, then Riley is its protector behind closed doors. After being named Coach of the Year three times, Riley was elected to the Basketball Hall of Fame in 2008. In 2012 he was honored with the Chuck Daly Lifetime Achievement Award, presented each year by the National Basketball Coaches Association to the coach who best exemplifies integrity, competitive excellence and relentless promotion of professional basketball. Riley is also the only person in American sports to have won a championship as a player, coach and executive. That makes for an outstanding career and legacy, one that won’t be forgotten by the basketball world or Riley’s Sigma Nu Brothers. Check out my piece on Pat Riley. It will appear in print in the fall issue of The Delta, a Sigma Nu publication.